Significant updates from the December 11 regular meeting of Peace River Town Council are below. You can view the agenda and all Council items here. Underground Music Society – Deferred, more info requested. Council approved the interim operating budget summarized below. Municipalities require an operating budget to operate from day-to-day, the Alberta Municipal Government Act also requires municipalities to pass a balanced budget each year. Deliberations for the 2018 budget are beginning in January. 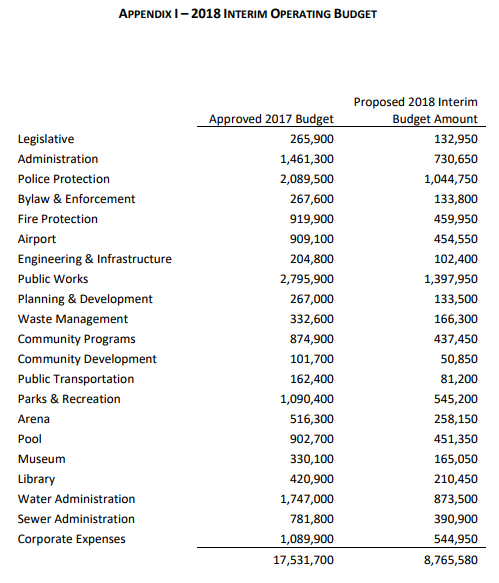 As a result, Council approved the following interim budget, which is 50 percent of the approved 2017 budget. Full details on the 2017 budget are available online, details about the 2018 budget process are also online. In June 2016 the Town of Peace River was made aware of the PurpleRung foundation and their goal of building transitional housing structures in Peace River.